This week I have been praying for a special intention. I found out that today, November 14th, is the Feast of All the Saints of the Order of the Blessed Virgin Mary of Mount Carmel and since we have a great devotion to St. Therese, who was a Carmelite nun, I decided to ask for her intercession. After Mass this morning I stayed to do a Holy Hour while the kids played at the playground. During that time a lady was in the church putting new flowers by Our Blessed Mother and she came up to me in the back of the church and asked if I wanted to take the old flowers home. I said yes, not realizing what the flowers looked like. She went up to the altar and took the flowers down and brought them back to me. It was a beautiful bouquet of small white roses. As soon as I saw them I smiled and thought how sweet St. Therese was to give me hope. I don’t how things will turn out, but I know she and all the Carmelite saints are interceding for us before our Heavenly Father. …on our last day of the novena for a very special intention. 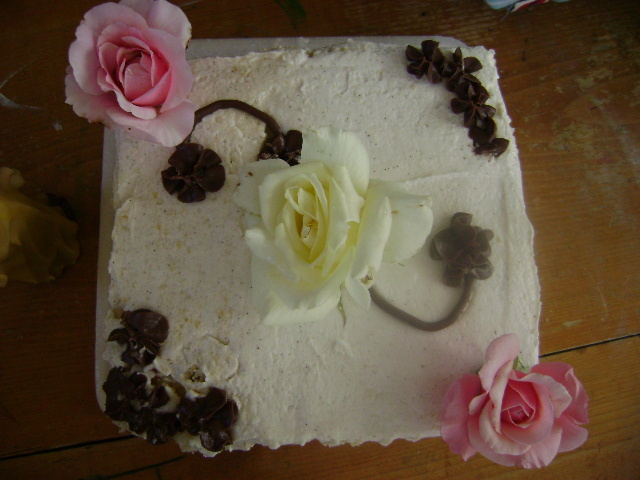 "I will let fall from Heaven…A Shower of Roses"
Make this beautiful craft. Thank you, Jessica! St. Therese, help me to always believe as you did, in God’s great love for me, so that I might imitate your "Little Way" each day. Amen. 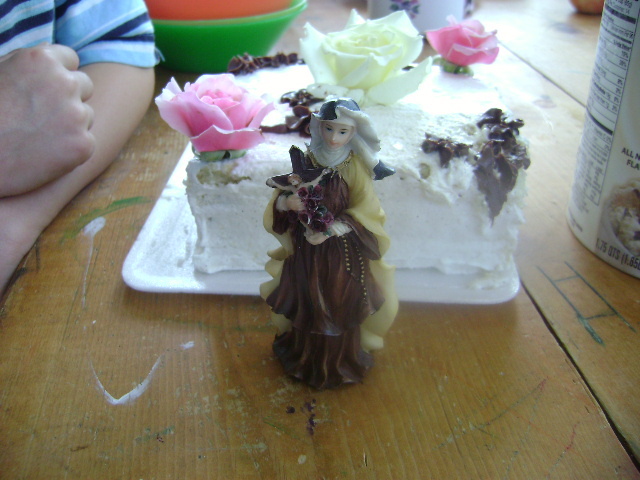 Today, October 3rd, our Holy Mother Church celebrates the Feast of St. Therese of the Child Jesus in the old calendar. We had a wonderful celebration this afternoon with our dear priest, Fr. C. We went to the Traditional Mass this morning, and afterwards, we came back for lunch. We had a beautiful cake decorated with roses from our garden. 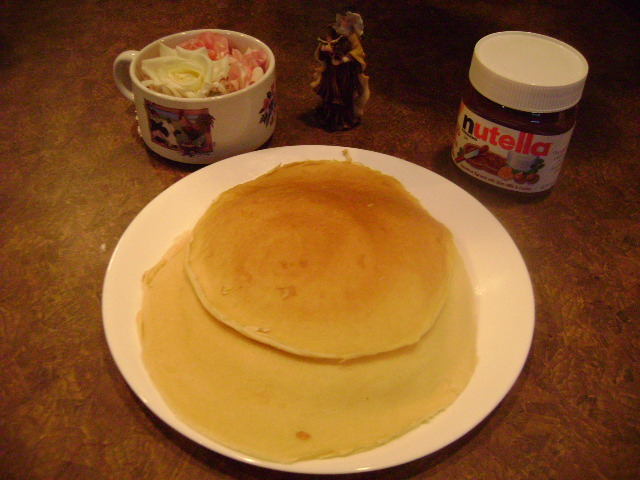 Tonight for dessert, we’re serving crepes with Nutella. 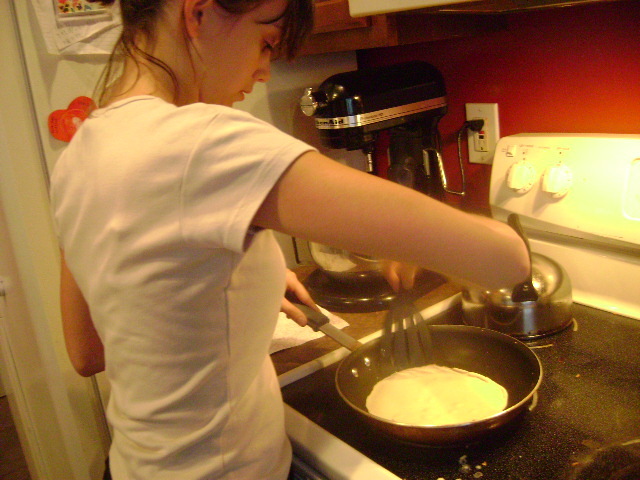 Thanks to Meredith for the recipe. 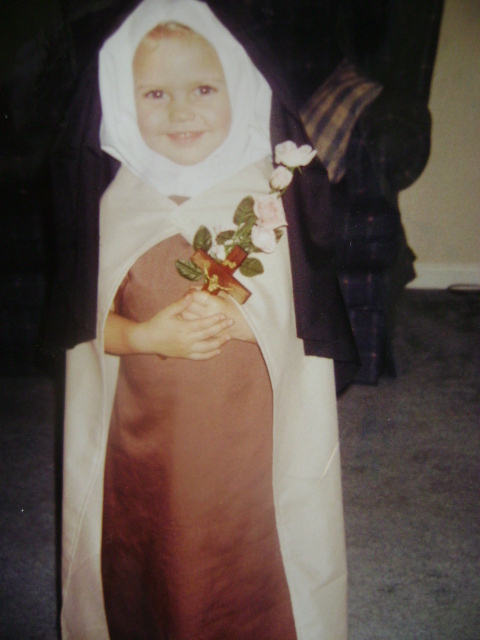 This is our little Marygrace dressed as St. Therese for an All Saints party when she was 3 1/2 years old. Here are the Daily Proper of the Mass for October 3 – St. Therese of the Child Jesus. 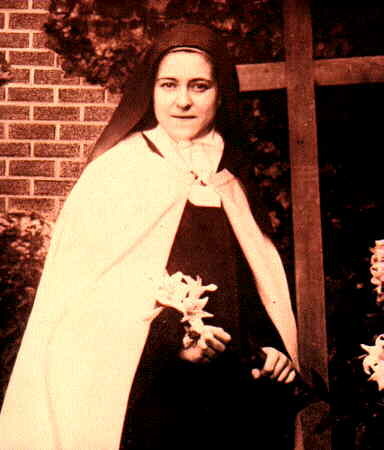 St. Thérèse, privileged Little Flower of Jesus and Mary, I approach you with childlike confidence and deep humility. I lay before you my desires, and beg that through your intercession they may be realized. Did you not promise to spend your heaven doing good upon earth? Grant me according to this promise the favors I am asking from you. Intercede for us all the days of our life, but specially during this Novena and obtain for us from God the graces and favors we ask through your intercession. Amen. O dear little Saint, now that you see the crucified Jesus in heaven, still bearing the wounds caused by sin, you know still more clearly than you did upon earth the value of souls, and the priceless worth of that Precious Blood which He shed to save them. As I am one of those children for whom Christ died, obtain for me all the graces I need in order to profit by that Precious Blood. Use your great power with our divine Lord and pray for me. Intercede for us all the days of our life, but especially during this Novena and obtain for us from God the graces and favors we ask through your intercession. Amen. 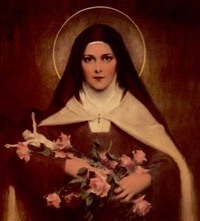 Dear Little Flower of Carmel, bearing so patiently the disappointments and delays allowed by God, and preserving in the depths of your soul an unchanging peace because you sought only God’s will, ask for me complete conformity to that adorable Will in all the trials and disappointments of life. If the favors I am asking during this Novena are pleasing to God, obtain them for me. If not, it is true I shall feel the refusal keenly, but I too wish only God’s Will, and pray in the words you used, that I "may ever be perfectly fulfilled in me." Intercede for us all the days of our life, but especially during this Novena and obtain for us from God the graces and favors we ask through your intercession. Amen. Little Flower of Jesus, from the very first moment of your religious life you thought only of denying yourself in all things so as to follow Jesus more perfectly; help me to bear patiently the trials of my daily life. Teach me to make use of the trials, the sufferings, the humiliations, that come my way, to learn to know myself better and to love God more. Intercede for us all the days of our life, but especially during this Novena and obtain for us from God the graces and favors we ask through your intercession. Amen. 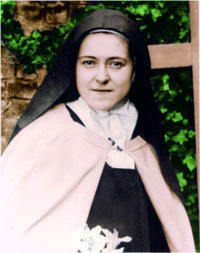 St. Thérèse, Patroness of the Missions, be a great missionary throughout the world to the end of time. Remind our Master of His own words, "The harvest is great, but the laborers are few." Your zeal for souls was so great, obtain a like zeal for those now working for souls, and beg God to multiply their numbers, that the millions to whom Jesus is yet unknown may be brought to know, love and follow Him. Intercede for us all the days of our life, but especially during this Novena and obtain for us from God the graces and favors we ask through your intercession. Amen. Dear St. Thérèse, like you I have to die one day. I beseech you, obtain from God, by reminding Him of your own precious death, that I may have a holy death, strengthened by the Sacraments of the Church, entirely resigned to the most holy Will of God, and burning with love for Him. May my last words on earth be, "My God. I love You." Intercede for us all the days of our life, but especially during this Novena and obtain for us from God the graces and favors we ask through your intercession. Amen. 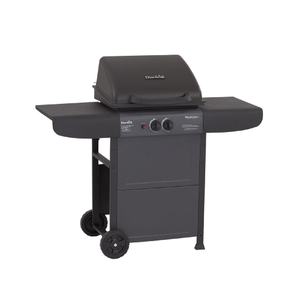 Comments Off on St. Therese’s Tuesday surprise- a grill !! !